100% Made in the U.S.A., assuring consistency in quality and availability. Patented Technology – American National’s reversible top cover. This special cover helps to alleviate body impressions caused by uneven wear. 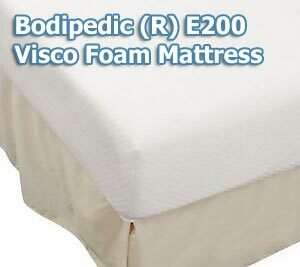 The dry cleanable 4-way stretch cover allows for the mattress to contour to your body’s individual shape and size. 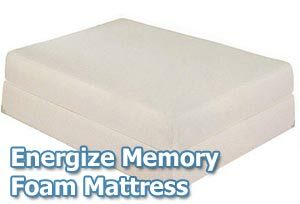 This combined with Summer/Winter reversible duvet pillow top allows a comfort level that must be felt to be believed. 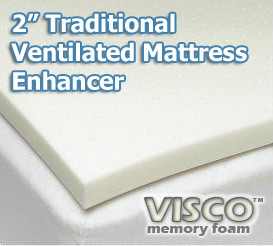 The reinforced concave foam cavity allows for the use of one of four 7″ water mattresses for individual adjustment of support and comfort. 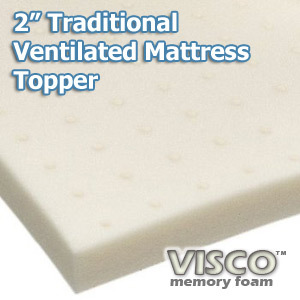 The Visco foam comfort layer and the convoluted foam comfort layer are both removable and reversible to promote even wear. 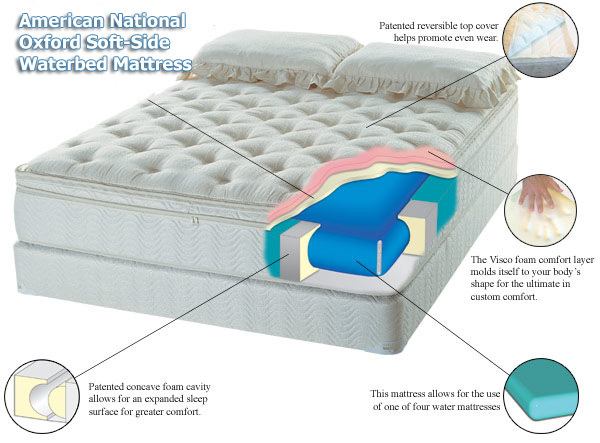 The Oxford’s reinforced concave foam cavity comes with American National’s patented “Perfect Perimeter” construction which allows for an expanded sleeping surface for greater comfort. Standard sizing eliminates the need for special furniture or bedding. 20 year limited warranty is your assurance of lasting quality. Dual Control (dual bladders) is two bladders to separate and allow each person individual control of their sleeping environment for the ultimate in comfort. If ordering a DUAL chamber then you will want to add two heaters, one for each of the water chambers. Free Flow Chamber – for those who like the natural fluidity of water with no wave reduction. Wave Reduced Chamber – 70% wave reduction with 3 layers of fiber. Waveless Chamber – 85% wave reduction with 5 layers of fiber. Ultra Waveless Chamber – 95% wave reduction with 7 layers of fiber and extra lumbar support. The usual downsides for the waterbeds like consuming body heat and being difficult to get in and out are pretty much solved in this case. The top memory foam layer prevents the body heat loss and the reinforced sides take care of the other problem so our opinion is that you’ll probably be very happy with this choice. Still note that it will probably take a while to get used to the mattress, especially if it’s your first of this kind. The offer gives you one more option we find pretty nice – wave reduction. If you like your bed soft go for the Free flow chamber, if you like it firm (definitely better for the back) go for the Ultra Waveless Chamber, or any of the other two options in the middle. Different chambers reflect on the price, but overall we consider it pretty fair. If you choose the Free Flow Chamber the mattress will cost you $1513.98 (dual chambers), the Wave Reduced Chamber option will be $1584.98 (dual chambers), the Waveless Chamber will be $1605.98 (dial chambers) and the Ultra Waveless Chamber will cost $1626.98 (dual chambers) (the prices listed are for the Cal King size only, but there are other sizes available.). 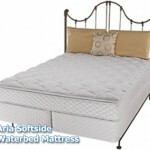 In the end – it’s a good mattress that really deserves your consideration.